Internet has now become a daily necessity for many of us. You can’t think of life without the use of Google, accessing social networking sites and checking your mails. The usage of internet is quite important for businesses to grow in today’s competitive market scenario. From conducting video conferencing to share business presentation or catalogue, internet helps businesses to promote their products and services effectively across the globe. Nowadays, just having a broadband connection for business is not enough for entrepreneurs. One has to have faster, better and reliable web connection to perform multiple tasks quickly. In comparison to many broadband connections in Gurgaon or Delhi, fiber-optic internet connection is considered as the fastest web connection. If you seriously want to enjoy web access like never before then don’t hesitate to ask from your internet service provider (ISP) before picking any connection for business. •Cost of the connection: There is a misconception among the users that fiber optic connection is quite expensive than other traditional connections. But in reality, it is actually not. If you look at the total usage of a month and the productivity with fiber connection, you will find it is comparatively cheaper than other connections. In fiber connection, you don’t pay for public bandwidth but only pay for your own bandwidth which makes it little expensive than other connections but at the same time you get faster speed and better connectivity. •Faster Web Access: Fiber connection has transformed the way businesses are doing online. Gone are the days when you and your workforce need to wait for long to download even a file of 5 MB. With this connection, you not just get faster web access but can also download or upload heavy files instantly without facing issue of slow connection. Data transmit rate is quite higher with this connection. Users can get speed of 10-1000 Mbps with fiber connection. •Better Bandwidth: If you are using traditional web connections then it is quite expensive for you to upgrade your connection for getting bigger bandwidth. As many service providers need to install new systems and instruments to provide better bandwidth to the users. Unlike other traditional connections, fiber is more flexible enabling ISPs to add more bandwidth to their systems or servers. It just needs a minute to your service providers to change your connection settings to provide larger bandwidth for faster internet access. •No Hidden Charges: The best thing with fiber optic connection is that you don’t need to pay as per your data usages as there are only two types of charges applicable on fiber web connection – Port charge and Bandwidth charge. 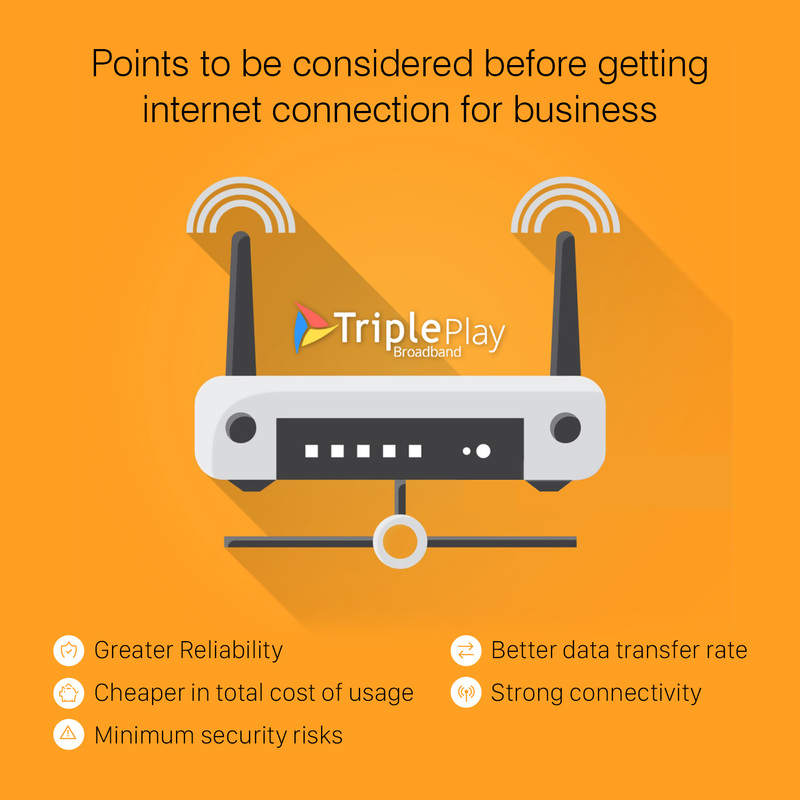 Understanding the need of the hour, there is a reliable broadband service provider – TriplePlay which always believes in adopting the latest and innovative techniques, tools and equipments to provide best internet connection in India to the users. Not just excellent web access, but the users of TriplePlay Broadband also gets unmatchable customer support. So switch to faster, better and effective web connection now to boost the productivity of your business!